Dedicated educators, the PSQ have been recent guests at Bloomington Indiana University’s String Academy, the Beijing Conservatory, University of Southern California (Los Angeles), University of British Columbia in Vancouver, and with their partner universities in Osnabrück, Germany and Lyon, France. To this day the PSQ is a devoted champion of the music of our time, having premiered over 100 new works from composers in Canada and abroad. Penderecki Quartet’s large discography includes over three dozen recordings including the chamber music repertoire of Beethoven and Brahms on both the Marquis and Eclectra labels, as well as the first Canadian release of the six Béla Bartók quartets. Their disc of Marjan Mozetich’s “Lament in the Trampled Garden” won the 2010 JUNO Award for Best Composition. In October 2013, the PSQ worked with Maestro Krzysztof Penderecki on his Third Quartet (2008) and performed it at Symphony Space in New York City on the occasion of his 80th birthday. This followed with the recording of Penderecki’s Third Quartet along with quartets of Norbert Palej on the Marquis label. The Penderecki Quartet has performed with such eminent classical artists as Martin Beaver, Atar Arad, Antonio Lysy, Jeremy Menuhin, James Campbell and enjoy exploring new music collaborations having recently appeared with jazz saxophonist Jane Bunnett, Brazilian jazz pianist Egberto Gismonti, pipa virtuoso Ching Wong, Dancetheatre David Earle, Pentaedre Wind Quintet, actor Colin Fox, and New York turntable artist DJ Spooky. 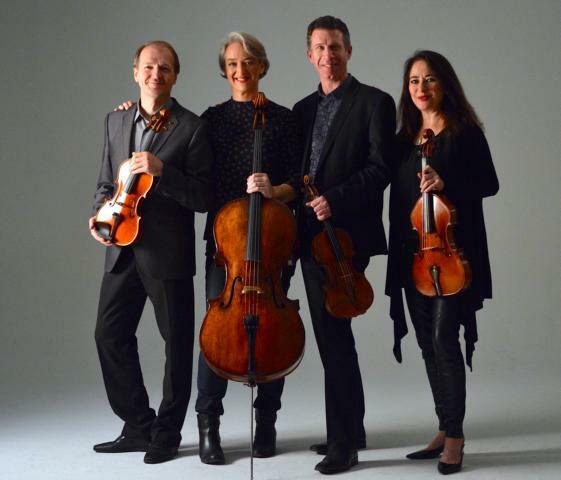 The Penderecki Quartet continue to be active members of the Faculty of Music at Laurier University where they have built the string program to be one of the top programs in Canada, attracting an international body of students. Their annual Quartetfest at Laurier is an intensive study seminar and concert series that has featured such ensembles as the Tokyo, Lafayette, Miro, Ying, and Ariana String Quartets.